Winner of the BEST OF 2015 Flaviar Community Award! This Spanish distillery is located just outside of Barcelona, in Vilanova, a small fishing village that lies between Costa Brava and Costa Dorada. The distillery is owned by the Giro Ribot family, which has been in the wine and spirits business since 1835. The family’s first foray into Gin began in 1940 when Manuel Giro Sr launched Gin MG, now one of Spain’s best selling Gins. Years later grandsons Mark and Manuel Jr wanted to continue the family tradition and crafted their own Gin, inspired by the Mediterranean climate, using locally sourced botanicals. To produce Gin Mare they used the family housed in a chapel that was once a monk’s retreat. Talk about the Holy Spirit! Gin Mare truly is Mediterranean, in spirit and in taste. The premium barley base is infused with traditional Gin botanicals, but also specialties of the Mediterranean - basil from Italy, thyme from Greece, rosemary from Turkey, citrus fruits from Spain, and their liquid gold: The ARBEQUINA OLIVE; the only olive in the world with its own Designation of Origin. Due to the low yield of the Arbequina olives when juiced, they have to use an astounding 15 kg of olives per each distillation batch. The citrus they add is macerated for a full year before being used, while other botanicals take around 36 hours. All of these botanicals are individually distilled in a 250-liter Florentine still, and are blended together only after the individual distillations have taken place. 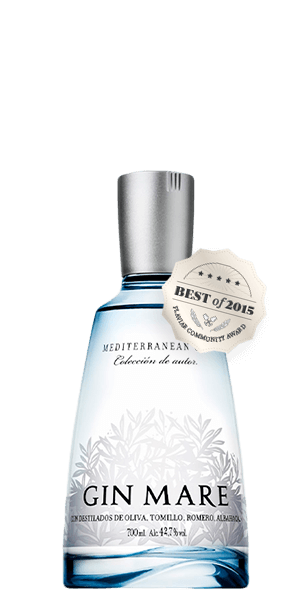 What does Gin Mare Mediterranean Gin taste like? The Flavor Spiral™ shows the most common flavors that you'll taste in Gin Mare Mediterranean Gin and gives you a chance to have a taste of it before actually tasting it. Herbal with balanced notes of rosemary, thyme and berries. Love, love, love this gin!! It has become a house staple. Smooth, complex, and amazing with Fever-Tree Mediterranean Tonic Water. Beautifully balanced with rosemary and olive (the other notes of basil and thyme are there too). Very fresh taste of mediterranean herbs, goes extremely well with tonic without kinin. True summer evening drink. I did not like it. Very bitter. Made G&Ts with this and Fever Tree and a couple of friends said it was the best they had ever had. Tried on its own the gin is smooth and unique. Best with mango skewers and mediterranean fever tree tonic. Lovely citrus aroma and flavor. May get a bottle for making gimlets this summer! A little harsh on the tongue, but smooth as silk going down. I'd buy this to share with others. So smooth and light. Flavored meld together very well. I am not a fan of gin, but I love this one. Fantastic! I never knew gin could be so good! One of the few gins that is best served neat! So good! I get the rosemary and thyme for sure, and while it's subtle it's so, so good. One of my favorite drinks so far from Flaviar and I've only taken a couple sips. Really liked this one. Delicate flavor. I definitely got the rosemary, citrus, and generally herbal flavor. Might be a great in a Martini or something light that allows the gin flavor to come through.